Yarra Valley is one of Australia’s leading cold climate regions and the birthplace of Victoria’s wine industry. It took us a while to get our feet on the ground after our long journey from North Carolina to Melbourne, Australia. After a day of exploring Magnificent Melbourne and then taking in night matches at the Australian Open, we were ready for some vino. Our destination was the “place of mists and shadows,” which is a name given by the Wurundjeri people the traditional landowners in the Yarra Valley. The region, located on the eastern outskirts of Melbourne, is a cool growing area known for Pinot Noir, Chardonnay and sparkling wines. Known as the birthplace of Victoria’s wine industry, its history stretches back to 1838. The first golden age was short-lived and in 1973 the first commercial vintage in 50 years was produced. Now the region shines with quality wines– thanks to a second wave of winemaking pioneers. 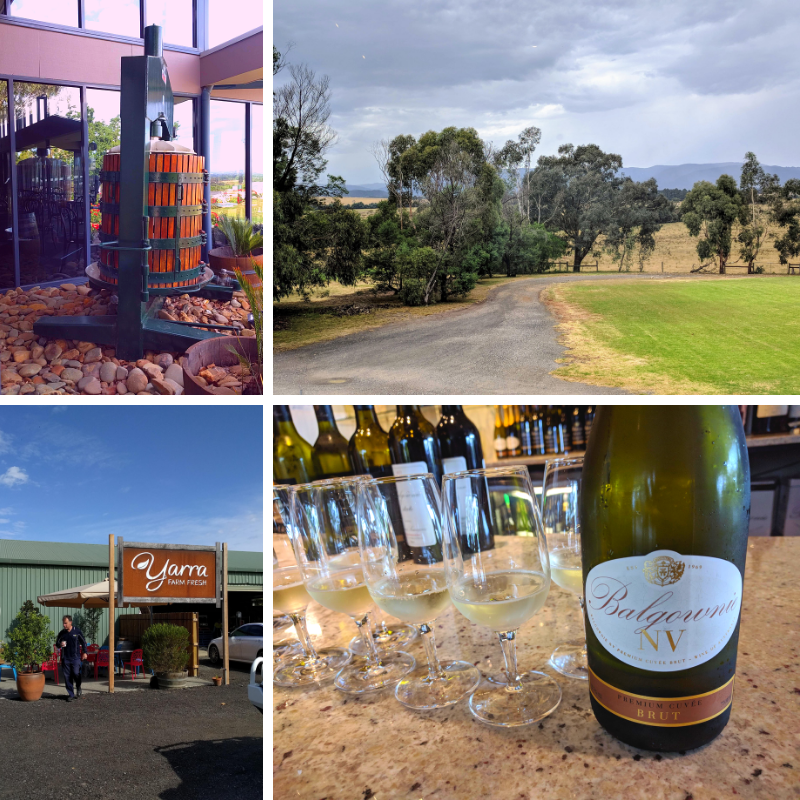 Our tour was billed as a Yarra Valley Gourmet tour and our first stop was Yarra Farm Fresh, a farm market where we enjoyed fresh fruit and some refreshing juices including a nice mix of apple juice and ginger. It was a nice pick-me-up on what was shaping up to be a very hot day. Balgownie Estate was the first winery visit. Their beautiful cellar door (tasting room) overlooks rolling vineyards and the complex features an upscale restaurant, lodging and a day spa. In Yarra Valley, diverse geography, climate differences and varying soils allow a wide assortment of grape varieties to grow. 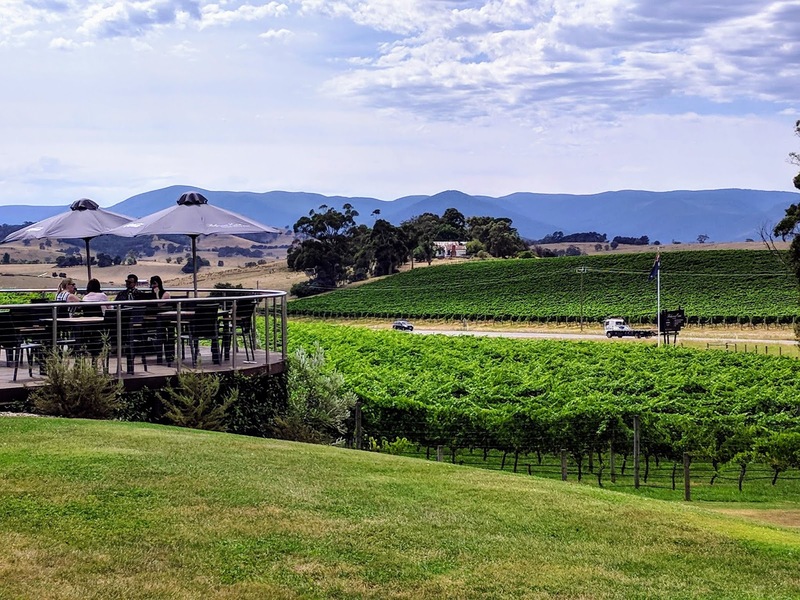 Balgownie’s Yarra Valley estate vineyards are planted to Chardonnay and Pinot Noir, but their Bendigo estate vineyards, first planted in 1969, are known for their reds. We opened with the NV Premium Cuvée Brut. This is a sparkler made in the traditional method from mostly Chardonnay and Pinot Noir. A portion is fermented in old oak barrels and gets extended lees contact. Lovely and crisp with tropical fruit and toast notes. Retail AU$21. The 2016 Black Label Sauvignon Blanc had a burst of the classic aroma of cut grass. On the palate there were bright tropical fruit notes and a splash of passionfruit. The acidity was nicely balanced, midway between a New Zealand Sauvignon and one from California. This is priced at AU$25. Black Label is the entry range for Balgownie. We tried the Black Label Shiraz (2016) and 2017 Sparkling Shiraz. The Shiraz is light in style with a bit of herbaciousness. It is quite smooth. The 2017 was the first of several sparkling Shiraz we had during the trip. Apparently, this is a popular holiday drink. This one didn’t appeal to me, especially compared to the Cuvée Brut. The Bendigo Estate Cabernet Sauvignon and Shiraz (both 2015 vintage) were a significant step up in quality and complexity. Selling for AU$45, they come from vineyards planted almost 50 years ago. The Shiraz is light in style with blueberry and plum notes and flowing tannins. The Cabernet is rich and medium bodied with a touch of oak and earth. 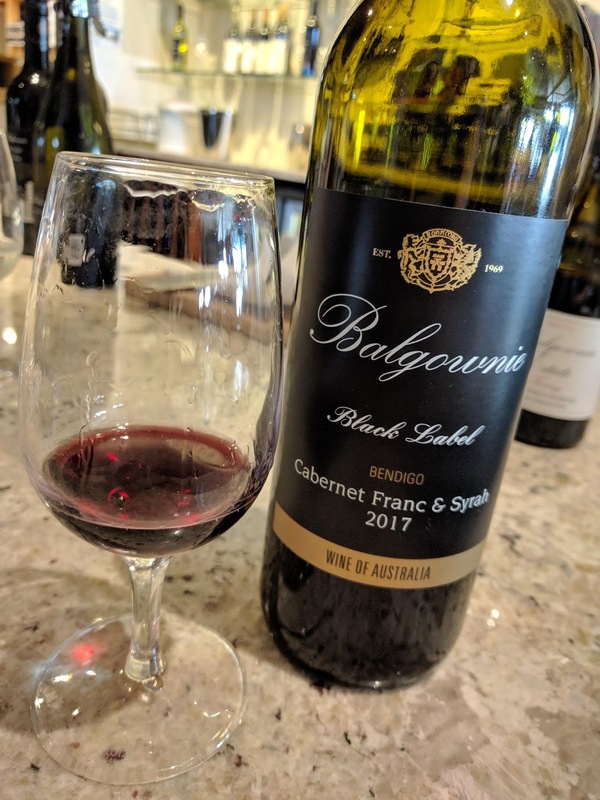 For the first time, Balgownie produced a Cabernet Franc in 2017. They blended it with a small amount of Syrah (interesting that they didn’t call it Shiraz). The majority of the wine was aged in used French oak barriques with 5% being aged in new oak. I’m a Cab Franc fanatic, and so we purchased a bottle for AU$29 (or about $21 US). It was a tasty deal that travelled back home in our luggage.